Laycock was born in Westminster on 18 April 1907, the eldest son of Brigadier General Sir Joseph Frederick Laycock (died 1952)—an officer of the Royal Regiment of Artillery knighted for his services during the First World War—by his marriage on 14 November 1902 to Katherine Mary (Kitty) Hare (1872–1959), who was previously married to and divorced by the 6th Marquess of Downshire (died 1918), and herself a granddaughter of William Hare, 2nd Earl of Listowel. Laycock was thus a half-brother of the 7th Marquess of Downshire; their sister Josephine (died 1958) married Edward Greenall, 2nd Lord Daresbury, and is grandmother of the present Baron. Through his father's relationship with the married Daisy Greville, Countess of Warwick, issue occurring before and during his marriage with Kitty, Robert Laycock was half-brother to the Countess of Warwick's son Maynard Greville (1898-1960), and daughter, Mercy Greville (1904-1968). Laycock was educated at Lockers Park School and Eton College, followed by officer training at the Royal Military College, Sandhurst, from which he emerged as a well-read young man with a scientific bent. [according to whom?] He also briefly worked in a factory. 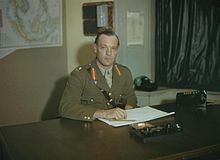 In 1954, his old friend, Anthony Head, now Secretary of State for War appointed Laycock to the position of Commander-in-Chief and Governor of Malta. This was during a period of tensions surrounding a drive for independence, with Prime Minister Dom Mintoff leading a campaign for "Integration (with Britain) or Self-Determination", and the Nationalist Party looking for a "Quasi-Dominion Status. Prior to his assuming the position of Governor, Queen Elizabeth knighted Laycock in the drawing room of Sledmere House, Yorkshire whilst staying as fellow house guests of Sir Richard Sykes, Baronet. Laycock served until 1959, having had his term extended twice. A noted horseman, yachtsman and historical book collector, his interests made him a man who could enjoy life. It was said by many[by whom?] he had no enemies. His estate was probated at £279,910. Laycock was married in 1935 to Claire Angela Louise Dudley Ward (1916–1999) younger daughter of the Right Honourable William Dudley Ward, Liberal MP for Southampton by his wife Freda Dudley Ward née Winifred May Birkin, granddaughter of Sir Thomas Isaac Birkin, 1st Baronet. By his wife, he had two sons, and three daughters. His wife Angela, Lady Laycock, died in 1999. Emma Rose Laycock, now Lady Temple (born 1943), married 1964 Sir Richard Chartier Carnac Temple, 5th Bt. (born 1937), elder son and heir of Sir Richard Antony Purbeck Temple, 4th Bt., of The Nash, MC ( 1913– 5 December 2007) by his first wife Lucy Geils de Lotbinière, dau of Alain Joly de Lotbinière, of Montreal; they have issue, three daughters. Katherine Martha Laycock (born 1949); married 1969 David Mlinaric (born 1939), interior designer and decorator, has three children. ^ Michael Rhodes, with supplements by Brooke. " 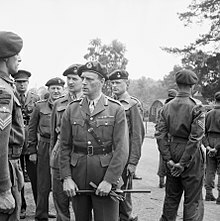 Sir Richard Antony Purbeck Temple, 4th Baronet, MC (1913–2007)". "Peerage_News" group on Google, 8 December 2007. The baronetcy was created 1876 for Sir Richard Temple, 1st Baronet, a British India colonial administrator. This page was last edited on 31 May 2018, at 14:58 (UTC).